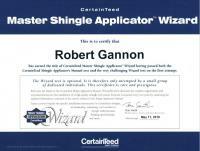 Robert Gannon, Owner of Storm Shield LLC was awarded the title of "CertainTeed Master Shingle Applicator Wizard" after passing both the CertainTeed Shingle Applicator's Manual test and the Wizard test on the first attempt. Robert Gannon, owner of Storm Shield LLC, became a certified CertainTeed Shingle Quality Specialist after passing the CertainTeed Shingle Technology Manual test. 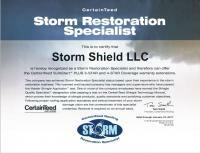 Storm Shield LLC is recognized by CertainTeed as a Storm Restoration Specialist. This means that we can offer one of CertainTeed's very best warranties- the SureStart Plus 3-Star and 4-Star Coverage warranty extensions. This title also certifies that multiple employees of our company have passed various certification tests and are experienced in the storm restoration business. 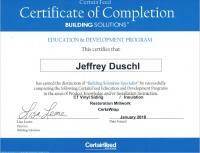 Jeffrey Duschl is a certified Building Solutions Specialist with CertainTeed after completing extensive training in Vinyl Siding, Insulation, Restoration Millwork, and CertaWrap. 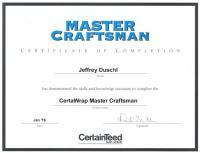 This certificate shows Jeffrey Duschl's completion of training in CertaWrap. 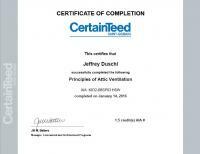 This certificate shows that Jeffrey Duschl has completed CertainTeed's training on Principles of Attic Insulation. Vinyl Siding: Basics and Beyond is a program offered by CertainTeed to ensure that all of the installers have the qualifications necessary to use the product correctly. 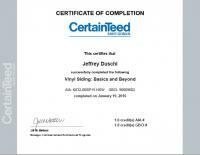 Jeffrey Duschl completed this program and this certificate shows that he is the expert in all things vinyl siding. 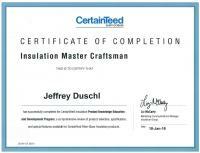 Jeffrey Duschl is a certified Insulation Master Craftsman after completing the manufacturer's Product Knowledge and Development Program. This certificate from CertainTeed showcases that Jeffrey Duschl has complated the Education Program in Restoration Millwork. CertainTeed is a leading and innovative North American manufacturer of building materials including roofing, trim, vinyl siding, railing, decking, insulation, and many others. The Master Shingle Applicator program provides education in every aspect of shingle installation. Jeffrey Duschl was awarded the title of "CertainTeed Master Shingle Applicator Wizard" after passing both the CertainTeed Shingle Applicator's Manual test and the Wizard test on the first attempt. 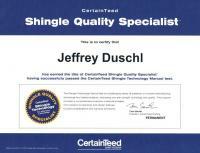 Jeffrey Duschl became a certified CertainTeed Shingle Quality Specialist after passing the CertainTeed Shingle Technology Manual test. 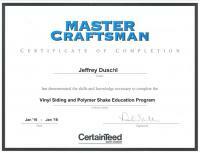 Jeffrey Duschl completed the Education program for Vinyl Siding and Poylmer Shake, which gives him the title of Master Craftsman with CertainTeed. 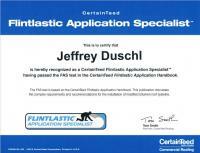 After completing extensive training and passing the FAS test in the CertainTeed Flintastic Application Handbook, Jeffrey Duschl was awarded this certificate to confirm that he is now a specialist.